Photo: A sala within a cave. Located a short ride from the main park headquarters in the park’s southern reaches, Khao Daeng ("Red Mountain") is the best place in Sam Roi Yot to get a solid hike with breathtaking views as your reward. The trail begins just off the main road and climbs steeply up to the 157-metre-high lookout, where you can sit back and enjoy northern vistas over the mountains and shrimp farms down below, and eastern views out to the Gulf. Come very early for what’s sure to be a memorable sunrise (no, we didn’t get up to vouch for it). It’s quite a hard climb but well worth it. Take plenty of water, do not go alone, and pass on climbing if it has rained recently. The trail is not very clearly marked and there were no national park officials on site during our visit. The hike takes around 45 minutes for those in average shape. Be sure that you reach the true summit -- look out for a wooden sign there -- as a few decoys dot the trail. The trailhead begins from the end of a sandy turnoff off from the main road, 400 metres north of park headquarters. The trail is signposted and runs off to the left near the small parking area. Browse our independent reviews of places to stay in and around Khao Sam Roi Yot National Park. Read up on where to eat on Khao Sam Roi Yot National Park. Check out our listings of things to do in and around Khao Sam Roi Yot National Park. Read up on how to get to Khao Sam Roi Yot National Park, or book your transport online with 12Go Asia. Planning on riding a scooter in Khao Sam Roi Yot National Park? Please read this. 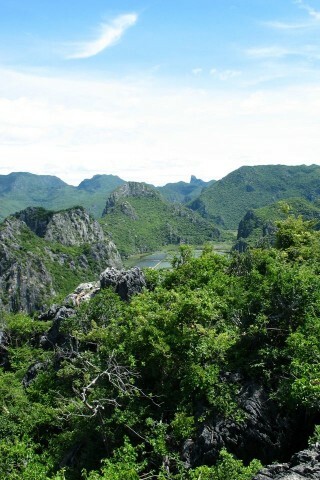 See below for more sights and activities in Khao Sam Roi Yot National Park that are listed on Travelfish.org. Where are you planning on heading to after Khao Sam Roi Yot National Park? Here are some spots commonly visited from here, or click here to see a full destination list for Thailand.